But with a wee problem. Davy Jones has called in his debt. For raising The Black Pearl from the icy depths and making Jack captain for thirteen years in exchange for one hundred years service on the Flying Dutchman. Not a deal Jack wishes to settle. 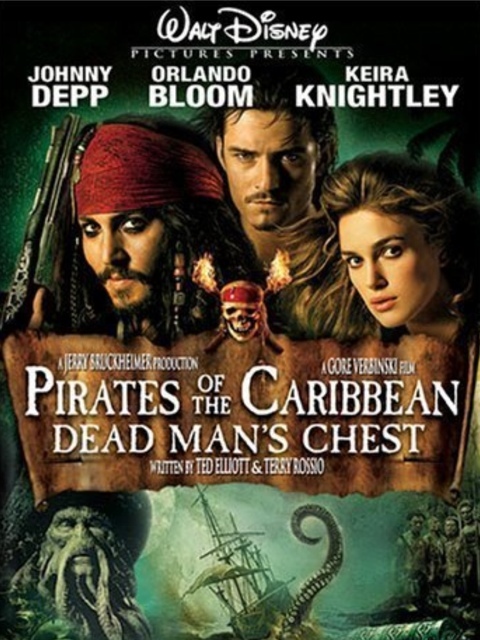 After an eerie warning from “Bootstrap” Will Turner (Stellan Skasgård), a barnacled (literally) crew member from the Flying Dutchman Jack Sparrow (Johnny Depp) orders the Black Pearl to make for land. At the same time Will Turner (Orlando Bloom) and Elizabeth Swann (Keira Knightley) are about to be wed when they are interrupted by Beckett (Tom Hollander) acting for the East India Company. Another wonderful adventure for our three heroes and with reprisals by a huge portion of the first cast (Jonathan Pryce, Kevin McNally, Jack Davenport, Giles New, Angus Barnett, Lee Arenberg, Mackenzie Crook). Harsh to relegate Geoffrey Rush into supporting cast but the cast is so huge now that it’s hard for any but the big three, plus Bill Nighy and Tom Hollander, to get a great presence. The supporting cast though are still superb in this movie, have no doubt. Bill Nighy brings a wonderful menace to the roll of Davy Jones. But the cursed sailor of the dead somehow loses out to the vicious yet all too human Beckett. Tom Hollander is a suitably awful villain. Again the effect guys get to do their thing with astonishing skill and beauty. The fishy crew of the Flying Dutchmen have a believability that is actually believable. How special effect have moved on this far in my lifetime I have no idea but I am thankful that spectacles like this are possible. Decent story played out well. Only just falls short of the high bar set by the first movie. Leaves the stage open for the third movie with excellent closing scene.